Aloha IZ fans! Sorry for the lack of posting recently, we’ve been very busy with new releases from other amazing Hawaiian music artists! But we wanted to let you know about the worldwide success of IZ’s music! Alone in IZ World has gone Gold in Belgium after reaching #1 on their radio and album sale charts. On the charts for 21 weeks! Platinum in Germany for Facing Future and Double Platinum for the Over the Rainbow single. The single is still the most downloaded single in the history of downloading in Germany! That’s for all genres of music. Gold in Switzerland for Facing Future and single Over the Rainbow. Alone In IZ World was #1 in Portugal for 22 weeks! The Best Of album was released in Poland on June 10th… and is climbing! In Sweden, The Best Of album will be released on August 10th. In Mexico The Best Of album will release at the end of July/beginning of August. In New Zealand, The Best Of album is at #5 nationwide. We are very close to Gold status there. In Australia, we have just licensed Over the Rainbow to be in an episode of Australia’s most successful TV show, Packed to the Rafters. And finally, in the US, Over the Rainbow was heard on the National Mall in Washington DC during the 4th of July fireworks show! 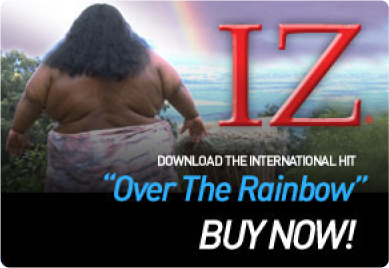 There is one comment on IZ’s Music Sweeping Across the World! I like your music and I support you !! !